These are some 1x1s I was working on over the last week. flickr set up an account here and start networking and you'll find many like-minded people to trade with. swap-bot an orgainzed trading site. 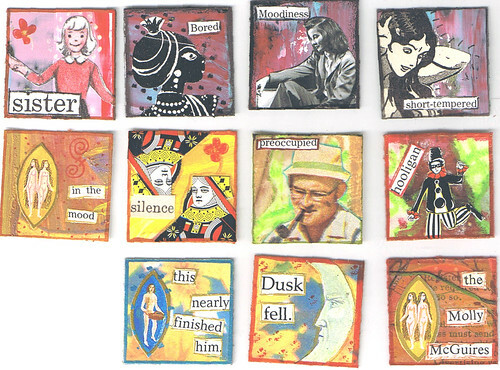 nervousness a mail art swapping site with a marvelous community of artists. zapbooks this is my own group on yahoo where we have themed 4x6 swaps every month. I received a fabulous package the other day of ephemera from an artist I admire greatly, Lia over at artjunkgirl. We did an ephemera swap and I am blown away with all the goodies she sent me. She even surprised me with one of her gorgeous 1x1s for my very own! Thank you so much Lia! I'm having problems figuring out how to get my camera to work with the new computer so I can't show a picture for you to drool over yet. But hopefully, I'll get it sorted out soon!